Additional information on Jordan on energypedia. The Hashemite Kingdom of Jordan covers an area of 89,342 km² on the northern Arabian Peninsula. It borders with Syria, Israel, Iraq, Saudi Arabia and the West Bank (Palestine) as well as the Red Sea, with only 1.5% of its surface being arable land. The climate is semi-dry in summer and cool in winter. Jordan has two main challenges regarding its energy situation: the growing energy demand on the one hand and the very limited domestic resources to fulfill this demand on the other hand. In 2012, the local production of energy – including crude oil, natural gas and renewable energy – was 272 ktoe (thousand tonnes of oil equivalent), which was enough to cover only about 5% of the energy consumption. Including imports, the primary energy supply was 7,624 ktoe in 2012. Final energy consumption in Jordan in 2012 added up to 5,013 ktoe. The share of the individual sectors is shown in table 1. The limited domestic resources meant that Jordan had to import 7,656 ktoe (thousand tonnes of oil equivalent) of energy to meet its demands. This means that the cost of the consumed energy amounts to as much as 17% of the GDP. In the past, one of the main sources of the imported energy was Egypt, from where Jordan imported natural gas. However, there have been problems of the service being disrupted, which caused enormous problems with regards to the energy security in Jordan. Therefore, Jordan has increased efforts to diversify its energy supply. In 2012, the government of Jordan eliminated all fuel subsidies. In 2014, Jordan’s finance minister stated that electricity subsidies will be eliminated by 2017. The use in Jordan of renewable energy sources has until now been marginal, accounting for a share of less than 1% of electricity generation. In 2012, of the 16.5 MW generated by renewable energy resources, 60.4% were hydropower, 21.1% biomass, 9.7% PV and 8.8% wind. Potentials for generating power from renewable energy resources in the country are to be found primarily in the areas of wind and solar energy. Jordan has a number of regions that enjoy wind speeds suitable for generating electricity. Those regions with the greatest potential are located in the North and South of the country. A wind atlas, which was drawn up by the Danish Risø research centre in cooperation with the Jordanian authorities, has been available for Jordan since 1989. According to the Ministry of Energy and Mineral Resources, this wind atlas is in the process of being updated with results taken from recent measurements. So far, two wind farms have been built and connected to the grid in Jordan. One has a generating capacity of 320 kW (4 x 80 kW) and was constructed in 1998, in cooperation with a Danish company, in Ibrahimyya near Hofa, as a pilot project. The second was completed in 1996 in Hofa (financed with funds from the German Eldorado programme) and has a capacity of 1.2 MW (5 x 225 kW). They generated around 3 GWh of electricity in 2012. The share of electricity from wind is supposed to significantly increase. In 2013, a contract was signed with a consortium of Jordanian and international companies for the 117 MW Tafila wind farm. It is supposed to increase the country's total power capacity by 3%, with commercial operation envisioned to start by mid-2015. A second contract has been signed on an EPC (Engineering, Procurement and Construction) basis with the Spanish company Elecnor. This wind park in Maan, a city in the South of Jordan, is supposed to produce 33 x 2 MW and to start supplying energy by the end of 2015. In Jordan, natural conditions for solar are excellent, with an intensity of direct solar radiation with 5 to7 kWh/m². So far, solar PV has mainly been used for powering off-grid installations such as telecommunication towers, water pumping, and desalination of brackish water, as well as to provide dwellings in remote areas that are not connected to the electricity grid and where desalination had not been installed. Until the publication of the Renewable Energy Law in 2012, an estimated 236.4 kWp had been installed in Jordan. In late April 2014, around 3 to 4 MW of PV systems had been installed on a decentralized level, with around 5 MW more under construction, all connected to the distribution grid under the net-metering scheme. It was estimated that more than 400 registered installation companies exist in Jordan, although only around 10 companies are actively doing business in the field for on-grid markets in early 2014. In addition, 12 projects with 170 MWp were to be constructed under the first round of Direct Proposals for PPAs that was initiated in October 2011. By April 2014 none of these projects had been realized yet, but negotiations were in their final stage, with financial closure to be accomplished by autumn 2014. In addition, two tendered PV projects, one totaling 2 MWp, financed by Spain in the Azraq area, and another totaling 65 – 75 MWp in Quweirah (Aqaba), financed through a fund of Abu Dhabi, were to be evaluated by the Ministry for Energy and Mining Resources (MEMR) in 2014. Jordan has no notable bodies of flowing water suitable for the construction of hydroelectric power stations. The only such plant is at the King Talal dam on the Az Zarqa River, with a capacity of 5 MW. Another hydroelectric generating facility employs a turbine to exploit the head of the cooling water taken from the sea to cool a thermal power station in Aqaba as it flows back to the sea. In 2012, these two stations together generated 61 GWh of electricity and were therefore the source of 0.4% of the electricity generated in the country as a whole. In cooperation with the United Nations Development Programme (UNDP), a project has been developed for utilising the methane gas that arises at the municipal waste disposal site in Amman. With the aid of the Global Environmental Facility (US$ 2.5 million) and the Danish development agency DANIDA (US$1.5 million), a biogas facility has been financed that captures the gases that arise at the landfill and uses a 1-MW generator to generate electricity for the interconnected power grid. The facility has been in service since 2000 and generates some 5 GWh of electricity annually. The installation is run by the Jordan Biogas Company, a joint stock company that is owned by the Central Electricity Generation Company (CEGCO) and the Greater Amman Municipality (GAM). Since 2001, the biogas sector has hardly been expanded; it produced about 6 GWh in 2012. Due to the arid climate, there is not a great deal of vegetation in Jordan. This obviously limits the potential use of vegetable biomass. The burning of vegetable biomass serves to a limited extent in rural regions for cooking and heating and is the main source of energy of the Bedouin in the desert. Great energy potential is to be found in household wastes (municipal solid wastes), which has an organic content of roughly 60%, and is estimated to add up to an annual total of 1.1 million tonnes. This equates to a daily per capita figure of between 0.35 and 0.95 kg of waste with a gross calorific value of 7-11 MJ/kg. The figures vary depending on the time of year and also differ between urban and rural regions. Geothermal resources in Jordan have been identified mainly in two regions. That said, both the sources on the eastern banks of the Jordan Valley and those on the plateau to the east of Madaba offer comparatively low temperatures below 100°C. This means they cannot be used to generate electricity and will continue to be used for thermal purposes only, such as for heating swimming pools and greenhouses. In 2013, the Jordanian interconnected power grid was supplied by an installed power station capacity of 3,193 MW. The generated and imported electrical energy amounted to 17,643 GWh in the same year. The available capacity development by type of generation since 2010 is outlined in table 2. In addition to the power stations operated by the public utilities, there are also a number of industrial enterprises that generate electricity in their own plants. Some of these also feed excess electricity into the Jordanian interconnected grid. Since the amount of electricity generated in Jordan has for some years been insufficient to cover the country’s needs, additional power used to be imported from Egypt and Syria. However, due to the circumstances in the region, import has been stalled completely (Syria, since 2012) or reduced (Egypt). The main consumer of electricity in Jordan is the domestic sector (including government buildings) which accounts for 43% of the total consumption, followed by the industrial sector (24%). Overall consumption has been steadily increasing in the recent years. The development of the electricity consumption per sector is outlined in table 3. The Jordanian national interconnected grid transmits electricity from the power stations to the distribution substations and transformer substations in the various regions of the kingdom via 400-kV and 132-kV power lines. The star topography of the grid has a clearly identifiable north-south axis, along which the only 400-kV power line runs, from Aqaba in the south via Amman and up to the Syrian border. The only area in which the grid has a ring-shaped configuration is around the capital city. In the north, the power grid is connected to the Syrian grid by means of a 230-kV and a 400-kV power line. In the south, there is a 400-kV connection to the Egyptian grid. The interconnected grid feeds the local distribution systems via which almost the entire population of Jordan receives its electricity. The overall length of the installed high voltage power lines (132 kV and 400 kV) is around 3,400 km. The National Electric Power Company (NEPCO) is planning to develop a new high voltage transmission network, called “green corridor”, running South-North in order to reinforce the electric grid. The project was initially planned for 2015, but due to delays it seems that it will be not be operational before 2018. The electricity tariff structure in Jordan takes into account social aspects as well as the economic capacities of consumers. In 2014, the electricity prices for the end consumer ranged from JD 0.033 per kWh for small residential consumers with less than 150 kWh per month demand to JD 0.292 per kWh for the banking sector. In 2012, the generation and distribution costs were JD 0.146 per kWh, whereas the average selling price was JD 0.0636 per kWh. The difference in price had to be covered by the state-owned National Electric Power Company (NEPCO), thereby creating a substantial deficit of JD 2.3 billion by the end of 2012. In order to reduce the losses, a National Strategic Plan has been developed. It foresees the adjustment of electricity tariffs and other measures to enhance the efficiency of the electricity system. By the end of 2017, NEPCO is supposed to be able to cover its costs. The plan prescribes the electricity price development for different consumer categories until the year 2017. Nevertheless, electricity is subsidized for many categories, e.g. for consumers with low electricity consumption. More than 96% of energy resources have to be imported. That is why, from an economic point of view, it is important for NEPCO as well as for consumers paying high prices for energy to look for cheaper alternatives of electricity supply. This is especially true since the overall political situation in the region remains unstable, making the option of cheap gas or electricity imports less probable in the near to mid-range future. Alternative energy sources such as shale oil or nuclear power require at least several years of exploration and development activities before deployment, and the LNG terminal for gas in Aqaba is still under construction. A growing population and the corresponding increase in energy consumption require solutions that can quickly generate additional electricity capacities. As a general rule, the issuing of licenses is regulated by the General Electricity Law, Article 28 onwards. In conformance with this law, the regulatory authority issues licenses to firms that wish to generate, distribute or sell electricity. Generating plants with a capacity of up to one megawatt are allowed to operate without a license. Local supply networks with a capacity of max. 100 kW can be operated without a license, in the same way as power plants that are used solely to generate electricity for self-consumption. Power supply companies or middlemen who want to purchase electricity from a power station with a capacity greater than 5 MW may conclude appropriate supply contracts only after competing in a public tendering process (Article 35). These rules apply equally to conventional thermal power stations and stations that generate electricity from renewable energy sources. To develop renewable energy capacities, a number of support mechanism have been introduced. For example, under the Jordanian net-metering scheme, the excess electricity fed into the grid is credited for later consumption. This excess electricity that is credited can be used to offset electricity used at other times, when there is little or no PV electricity production (e.g. at night). The legal basis for net-metering is the 2012 Renewable Energy and Energy Efficiency Law No. 13 (REEL). The REEL as well as bylaws enable Independent Power Producers (IPP) to provide electricity from renewable sources to NEPCO within long-term Power Purchase Agreements (PPA). Private investors may also invest in their own PV system up to 5 MWp to directly consume the electricity produced and offset it against their entire demand within a net-metering scheme. The REEL even allows the generation of electricity at a different site than where the actual consumer is located – so-called energy wheeling. As a result, there are two promising business cases that enable investments in renewable energies: Direct Proposals for PPAs under consecutive rounds of “expressions of interest” and net-metering. The Government has being attempting for a long time now to conclude contracts with Independent Power Producers (IPP) with the aim of expanding the number of power stations in Jordan’s electricity generating system. Initially, it made only slow progress. A number of potential projects were abandoned. Now, IPP projects with a total generation capacity of 740 MW (conventional energy) have been implemented. The IPP model is also used for renewable energy plants. However, by June 2014, no renewable energy plants had been constructed under the first round of the tender scheme and the following two rounds of direct proposals. In the first round, initiated in 2011, PPAs covering 170 MWp of solar PV were initially signed between 12 IPP companies or consortia and the Ministry for Energy and Mining Resources (MEMR). Until April 2014, these were in the process of financial negotiations between investors and the potential IPPs. Those systems were due to be constructed and connected to National Electric Power Company’s (NEPCO) transmission lines within the next 16 months. In the following two rounds of direct proposals, another 400 MWp of solar PV systems had been tendered for direct proposals, including four 50 MW plants and two 100 MW plants. In 2007, Jordan updated its Master Strategy for Energy for the period of 2007 to 2020, which had initially been drafted in 2004. The strategy aims at reducing energy imports through diversification of the energy mix by using local resources such as shale oil, nuclear power and renewable energies. Although at the moment the strategy still serves as a guideline for renewable energies, its assumptions can be considered to be outdated, especially since it assumes that nuclear and shale oil will cover a considerable share of Jordan’s energy demand by 2015 and 2020. In the Master Strategy for Energy in Jordan for the period of 2007 to 2020 there are also several recommendation concerning energy efficiency. These include the implementation of energy consumption efficiency programs in different sectors, broad awareness campaigns on the energy consumption rationalization, tax exemptions for energy saving equipment, thermal insulation of buildings and a national award in the energy consumption rationalization domain. 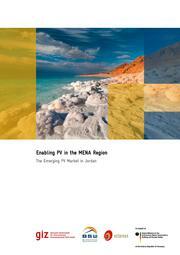 Jordan also introduced a National Energy Efficiency Action Plan (NEEAP) which is in the process of adaptation. 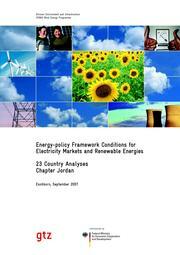 The NEEAP gives a national indicative target of 20% energy reductions by 2020 and six sectorial targets. The Ministry of Energy and Mineral Resources (MEMR) lays down the goals and political framework conditions for development of the energy market. Its core task is to facilitate continuing development of the country by ensuring adequate availability of energy. This is meant to be brought about with as little expenditure as possible, but while maintaining high standards. To this end, the ministry also intends inviting foreign investors in the fields of power generation, oil production and the development of other locally available sources of energy. The national power company, National Electric Power Company (NEPCO), is a joint stock corporation whose capital is completely in the hands of the Jordanian state. It is responsible for expanding and operating the nationwide transmission network. NEPCO purchases the electricity from the producers as the sole buyer, in order to sell it on to the operators of the distribution networks. The company operates a national load-dispatching centre to coordinate the demand for and the supply of power. Its unique position as single buyer and single seller and the subsidies for electricity led to massive budgetary deficiencies. In order to reduce the losses, a National Strategic Plan has been developed. It foresees the adjustment of electricity tariffs and other measures to enhance the efficiency of the electricity system. By the end of 2017, NEPCO is supposed to be able to cover its costs. Three private companies act as Distribution System Operators (DSO) in Jordan: The Jordanian Electric Power Company (JEPCO) is responsible for distributing electrical energy for about 66% of the country’s total consumers. It serves 5,000 km2 (Amman, Zarqa, Madaba and Al-Balqaa) and is made up of more than 5,600 main stations and substations with a total of 19,000 kilometers of underground and overhead lines. The Electricity Distribution Company (EDCO) was established in 1997 and is now responsible for distributing electrical energy to the southern part of the Kingdom, including Aqaba, Maan, Karak, Tafila, Jordan Valley, Azraq, Safawi, Royweshed, and Reshah. The Irbid District Electricity Company (IDECO) was established in 1957 and is now responsible for distributing electrical energy to the northern part of the Kingdom, which includes Irbid, Jerash, Mafraq and Ajloun. Four main generators are active in Jordan: The private company Central Electricity Generating Company (CEGCO), with a nominal capacity of 1,669 MW (2011), which produces around 52% of the electricity in Jordan (2010). The Samra Electric Power Generation Company (SEPGCO) is responsible for the operation of the conventional energy power plant in Al-Risha. In 2011 it had a nominal capacity of around 880 MW. IPP1 (AES Jordan) and IPP2 (Al-Qatraneh Power Generation Company) are combined cycle plants with a nominal capacity of 380 MW each. In the pipeline are two more IPP projects: IPP3 is implemented by the Korean KEPCO, the Japanese company Mitsubishi and the Finnish company Wartsilla. IPP4 is implemented AES and Mitsue, the same companies which run IPP1. Both IPP3 and IPP4 are on a Build, Own, Operate basis (BOO) and include the construction of generating plants run by heavy fuel oil, diesel oil and natural gas situated in the Amman East area. In 2004, the Jordanian Government submitted an application for a US$ 6 million grant from the Global Environment Facility (GEF/World Bank) for a development project in the field of wind power. Part of the remit of this “Promotion of a Wind Power Market Project” is to eliminate obstacles that stand in the way of the commercial use of wind power in Jordan. The aim on the one hand is to improve the legislative and administrative preconditions for the use of renewable energy resources. On the other hand, the project is also to comprise the construction of a 60 MW wind farm that is to be financed by private investors. So far, however, only US$ 350,000 has been approved for feasibility studies. Since 2005, the Japanese Government, together with the Jordanian Government, has been sponsoring four studies investigating the potentials of renewable energy resources in Jordan within the framework of the “Policy and Human Resources Development Fund” (PHRD) of the World Bank. The Japanese share amounts to US$ 1 million, while Jordan is contributing a further US$ 312,000. One particular focus here too is on the wind power segment. Furthermore, the United States Trade and Development Agency (USTDA) is funding (US$ 180,000) a feasibility study into the expansion of the existing wind farms in Hofa and Al-Ibrahimiya. Germany is one of the biggest bilateral donors in Jordan, along with the United States, Japan and the European Union. This bilateral cooperation focuses on the water sector. ↑ GIZ (2014): Enabling PV in the MENA Region. The Emerging PV Market in Jordan. This page was last modified on 10 July 2018, at 22:04. This page has been accessed 66,962 times.